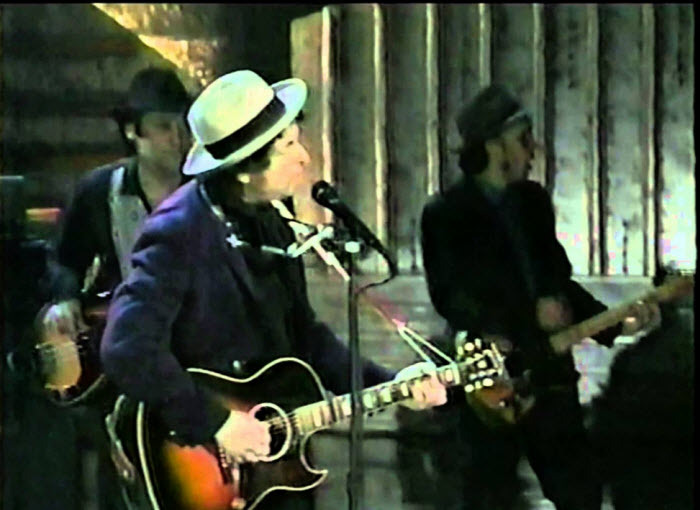 To see and hear how the band looked and sounded in February 1991, you just need to view television footage of the Grammy awards ceremony from New York on the 20th , when Dylan was given a Grammy Lifetime Achievement Award. Dylan’s appearance caused a media stir par excellence on two counts. Talking point one was his performance; number two was his acceptance speech. Dylan performed his damning anti-war3 indictment, “Masters Of War” – a striking choice given that the Gulf War was still going on and hawkish jingoism was rife. However, since he chose to sing it without a pause for breath, and backed by this hapless/hamstrung band, no-one who did not already know the song would have got the message. In fact, many who were familiar with the song did not even recognise it. Not only did Dylan’s nasal passages sound blocked (he later revealed he’d had a cold) but it seemed he had swallowed a burst of helium before starting to sing. Some observers thought he was singing in Hebrew. The tuxedoed crowd looked on in utter bewilderment. The next day’s newspapers marvelled how only Dylan had performed a song with any meaning and purpose, but then, being Dylan, he had made it completely incomprehensible. Bob Dylan receives his Lifetime Achievement Award. 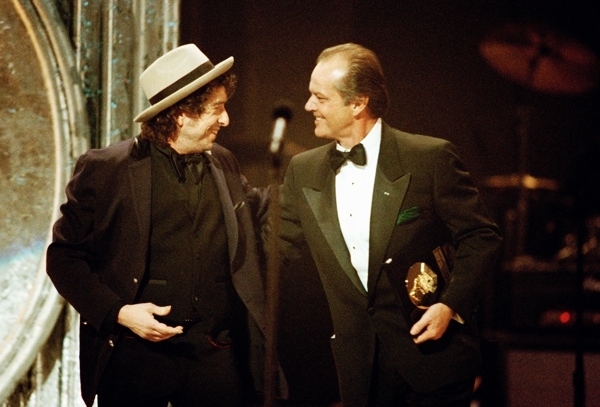 The award is presented by Jack Nicholson. Thank You … well … alright … yeah, well, my daddy he didn’t leave me too much … you know he was a very simple man and he didn’t leave me a lot but what he told me was this … what he did say was … son … he said uh …. [PAUSE] …. he said so many things ya know ….. he said you know it’s possible to become so defiled in this world that your own mother and father will abandon you, and if that happens God will always believe in your own ability to mend your ways. Those were dark days to be a Dylan fan. I was a high school student at the time. When in class the following day, a gloating classmate said to me, “Your hero is a drunk!” A teacher in another class commented on the event, also saying Dylan was hammered. Being a fan then was like wearing a KICK ME sign. I’ve since kept my musical tastes to myself. it reminds me of voicing a new song with syllables then going back and adding words to the match the sounds. This is the way it sounds before the words are discovered. I thought it was a great performance and interpretation of the song. Bob was still working on getting weird and being the same,but being the greatest songwriter of all time he gets a pass.